"Ferdinand" tells the story of a giant bull with a big heart. After being mistaken for a dangerous beast, he is captured and torn from his home. Determined to return to his family, he rallies a misfit team on the ultimate adventure. Set in Spain, Ferdinand proves you can't judge a bull by its cover. 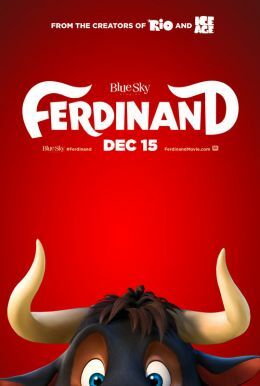 From Blue Sky Studios and Carlos Saldanha, the director of "Rio" and inspired by the beloved book"The Story of Ferdinand" by Munro Leaf and Robert Lawson, "Ferdinand" is a heartwarming animated comedy adventure with an all-star cast that includes John Cena, Kate McKinnon, Gina Rodriguez, Anthony Anderson and many more.